We are now offering additional 'Seasonal Discounts' on some of our properties for self catering holidays taken before the middle of July. Barton Cottage in Crackington Haven is a wonderful traditional cottage in a spectacular position next door to the famous church at St Gennys which must have one of the most dramatic locations of any in the British Isles. They are offering seasonal discounts of between £64 and £143, for weeks available in June. Bringing the price down to £495 for four people for a week. 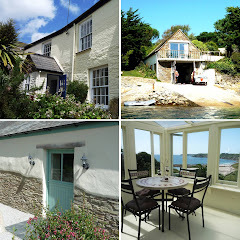 In North Helford, we have two splendid cottages, Nancenoy and Polweveral who are offering a seasonal discount of £50 off the list price for a weeks stay. They also have short breaks available from as little as £328.30. Located in the beautiful creekside hamlet of Port Navas, these terraced barn conversions are only a stone's throw away from the famous Duchy Oyster Farm. Near Stithians in Mid Cornwall, Gribbas Cottage are offering £50 seasonal discounts as well as a late availability discount for full week bookings. This delightful one bedroom cottage with thick granite stone walls and heavily beamed ceilings, is a really proper little Cornish cottage. With prices from as little as £229.20 for a couple for a week, Gribbas Cottage is the ideal getaway.